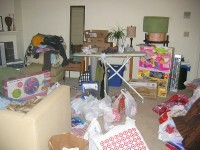 Has clutter prevented you from finding that item you need right now? It could be your car keys, an overdue library book or your mobile phone. It starts ringing. After tripping over the toys left on the floor, you sift through papers scattered all over the coffee table. Then the phone stops ringing. Damn! 1. After finishing using an item immediately put it away where it belongs so it can be easily found later. 2. Throw / donate / give away anything you no longer use. 3. Keep your papers neatly in one pile instead of scattered here, there and everywhere. 4. Wash that dirty plate or cup yourself instead of leaving it for someone else to do. 5. Have your family stick to the same routine. Teach your children the value of putting their toys away instead of leaving them around and having someone else clean up afterwards. If everything is put away after it has been used, in the long run will save you time. When you need your house keys or that mobile phone starts ringing, you can answer that call, grab your house keys and your home is kept neat and tidy.